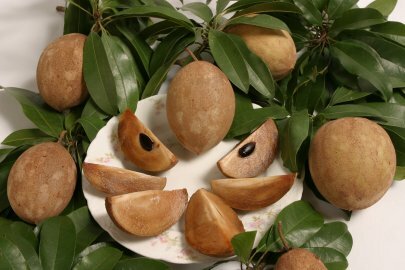 Santol is a common fruit in the markets throughout Indonesia and the Philippines. The fruit is about the size of a baseball and has a thin rind. The pulp is sweet to sub-acid and surrounds several large seeds. The fruit are typically eaten fresh, but they are also used to make jellies and preserves throughout India and Malaysia. Sapodilla have an exquisite flavor that tastes like a pear that has been soaked in brown sugar. Recent selections of improved varieties have a very fine texture and incredibly large fruit size. The fruit are most often eaten fresh, but they are great in milk shakes and cooked dishes as well. 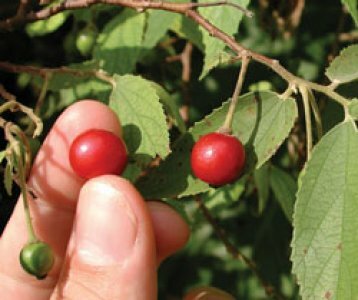 The fruit size and tree size can vary according to variety, but all varieties begin to bear at one to two years of age. 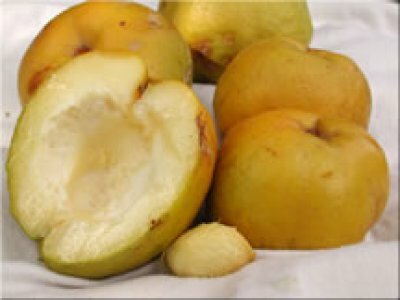 Click the link for the sapodilla viewer for cultivar specific information. 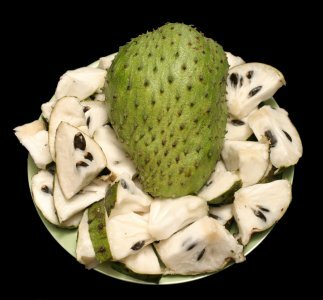 Soursop has a sweet and tart custard-like pulp. The fruit are typically heart shaped, and weigh up to ten pounds. They make superb milkshakes, but can be eaten fresh as well. The trees are fast growing, and they usually begin fruiting in just two years. The Spanish Lime is a very close relative of the Lychee and Longan. The male and female flowers, however, are born on separate trees, which makes them different from the Lychee and Longan. For that reason a female tree must be in relatively close proximity to a male tree to produce fruit. In addition, only the female trees produce fruit. 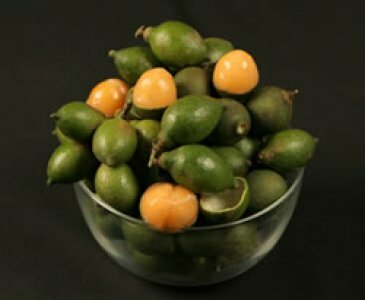 It is a very well known and highly regarded fruit throughout Latin America. The pulp is tart and melting, and it clings tenaciously to the seeds. The fruit of the Strawberry Tree are born on the outstretched branches of the tree. Each fruit is about the size of a blueberry and contains an abundance of tiny yellowish seeds too small to be noticed when eating. The flavor is often compared to cotton candy. The trees are highly ornamental and fast growing, providing a good source of shade and a fruit that is a favorite among children. 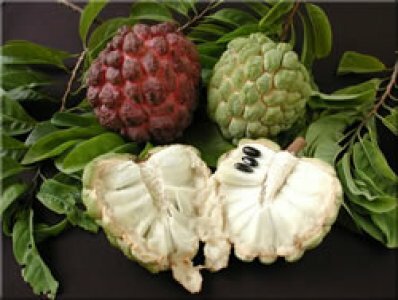 The sugar apple is an exquisite fruit that is very closely related to the cherimoya. The fruit are typically baseball- to softball-size, and they taste like sugary sweet custard. The pulp comes apart in segments, each containing a small black seed that separates easily from the fruit. The trees begin to fruit at just one to two years of age, and they can easily be maintained at eight to ten feet. 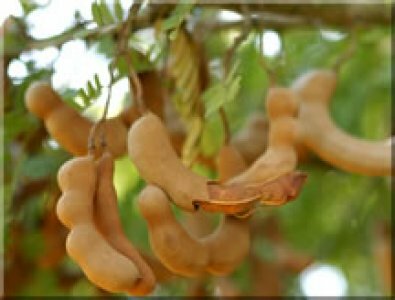 The tamarind is a graceful stately tree commonly found in the South Florida landscape and growing wild along Central American roadsides. The fruit hangs in clusters, peapod-like legumes typically six to eight inches long. The fruit is eaten fresh, in candies, and in sauces. In fact, it is one of the primary ingredients of Worcestershire Sauce, as well as numerous other jerk and barbeque sauces. In 2014, Americans consumed over 80 billion servings of tea*! The drink is fantastic source of antioxidantes which have been known to inhibit the growth of cancer cells and support cardiovascular health. All types of tea come from the same plants. Different rolling and drying techniques can be usesd with the same plant to produce both green and black tea. 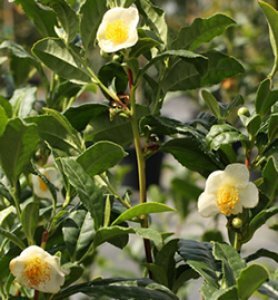 The plants are slow-growing and are best kept to a height of 4 ft., by pruning. Plant in well-draning soil in the sun or partial shade, or keep them in a container. *Per the Tea Association of the USA, Inc. 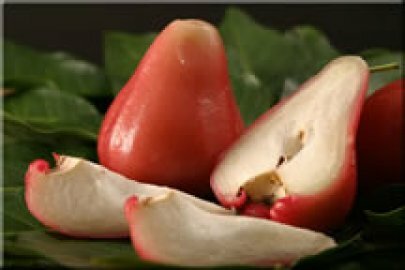 The wax jambu is an excellent fruit known for its crisp texture, mild flavor and cooling effect on the body. The flavor is reminiscent of an apple, with a hint of rosewater. They are often used as a garnish in fruit salads, and eaten out of hand. The trees fruit prolifically in just one to two years, and the fruit is an excellent treat on hot summer days. Trees can easily be maintained at ten to twelve feet, with biannual pruning. 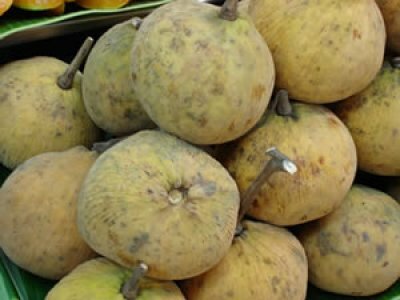 The white sapote is a superb but delicate fruit that tastes like a creamy sugar cube. 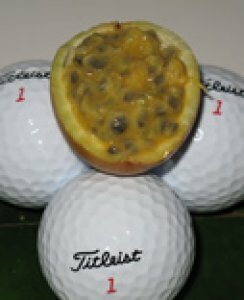 The fruit is typically baseball- to softball-size, and the trees begin fruiting in just one to two years. They are best eaten fresh and chilled, but are excellent in ice cream and milkshakes as well. In Mexico, they have a reputation for having a soporific effect, and have come to be known as the "sleepy sapote."